I am very, very, pleased with this purchase. It's always going to find a place in my pack for cool weather walking and backpacking"
Optional stud-on hood with Lycra edging. 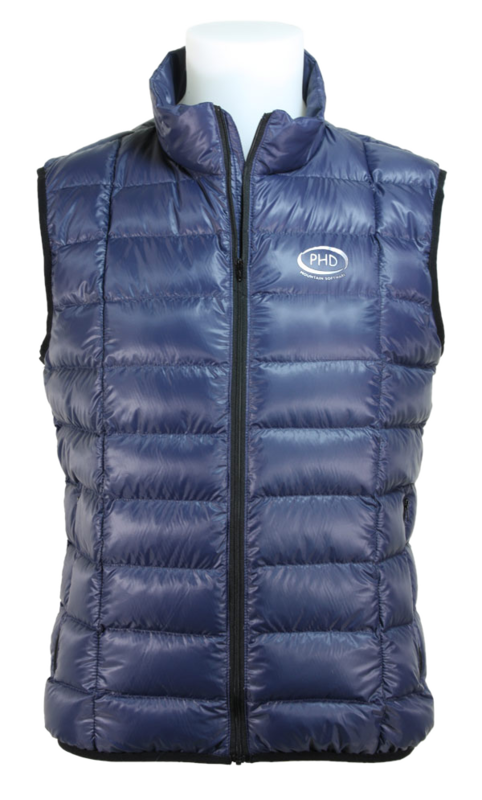 Wafers are the new ultralight down clothing from PHD. Real outdoor gear which will add a raft of choices to your gear selection. Vest, Jacket, Trousers, and Socks. One of the smallest, lightest packages of warmth we offer. Full zip front with two zipped handwarmers, all at 130gm inside our half-size stuff sac. 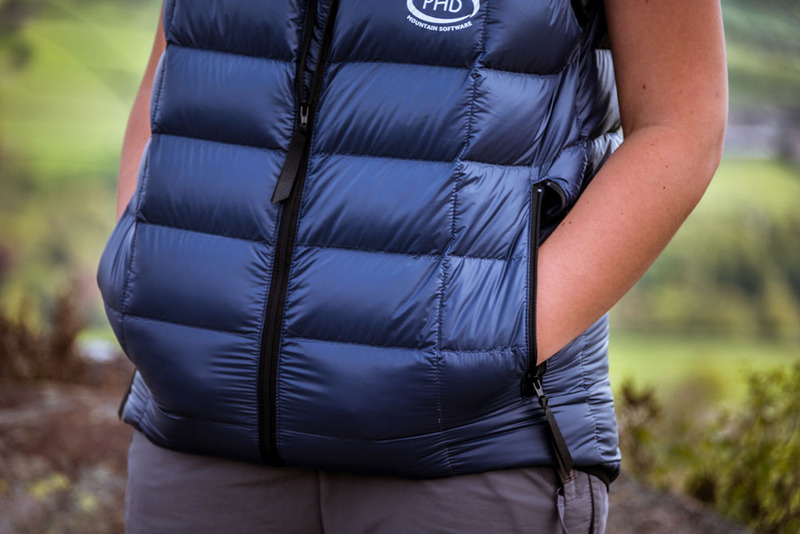 The Wafer vest will fit snugly under any of our down jackets, even the Minimus or the Yukon. This is the ideal warmer for spring or autumn camping, when that cold little evening wind makes the sunny afternoon a distant memory. And if the night's a bit colder than you expected, keep the Wafer Vest on inside your bag: a definite booster, particularly if you've got the Wafer trousers on too. Note: Fabrics as thin as 10X do not stand up well to direct abrasion, so we do not recommend our Wafer gear as actual climbing outerwear. But for all its thinness 10X is amazingly downproof and windproof and with reasonable care will go on giving you good service for years. 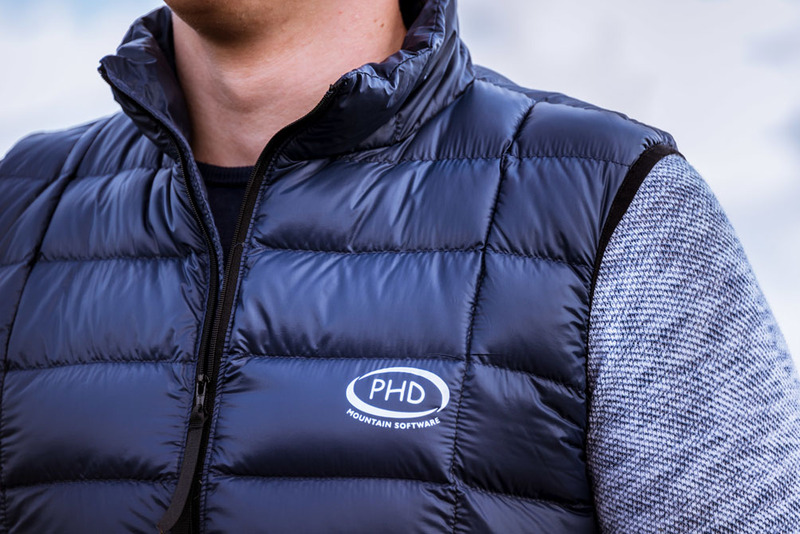 This vest is part of PHD's 'Ready Made' range. In stock and ready to ship within 5 working days. Also available in custom sizes (specify Body Width and Body Length Independently) with a longer dispatch time. "I've used it a hell of a lot, both on the hills and in just about every other scenario I can think about. I find this a truly superb piece of kit. There are two good hand warming pockets that have a generous capacity. The vest is lovely and warm when zipped up. PHD rate this as useful down to zero but I think you'd be happy wearing this, perhaps, down to -5°C. One of the main advantages of the Wafer Vest is that it is thin. This easily will slip under your shell jacket so that you can wear it while walking. I bought this jacket for extra warmth while moving not for extra warmth in camp and I think works very well for what I wanted it to do. 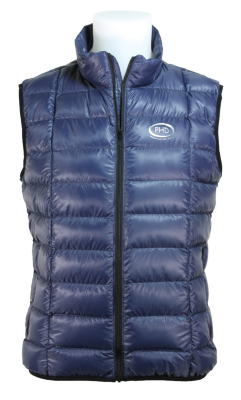 Wearing this vest under my jacket protects the down and adds little extra bulk. Although you want to keep down away from water down does wick steam and water vapour well. When working hard on the hill the vest is always very comfortable. When the temperature begins to rise a simple opening of the front zip will loose a lot of heat. When completely un-zipped the jacket is so thin and light that you almost don’t realise you are wearing it. The outer fabric of the vest is also very light but it doesn't seem too fragile and has coped well so far struggling through the usual woodland but remember this vest is designed to be worn under other protective layers. I am very, very, pleased with this purchase. At 190 grams it is always going to find a place in my pack for cool weather walking and backpacking."